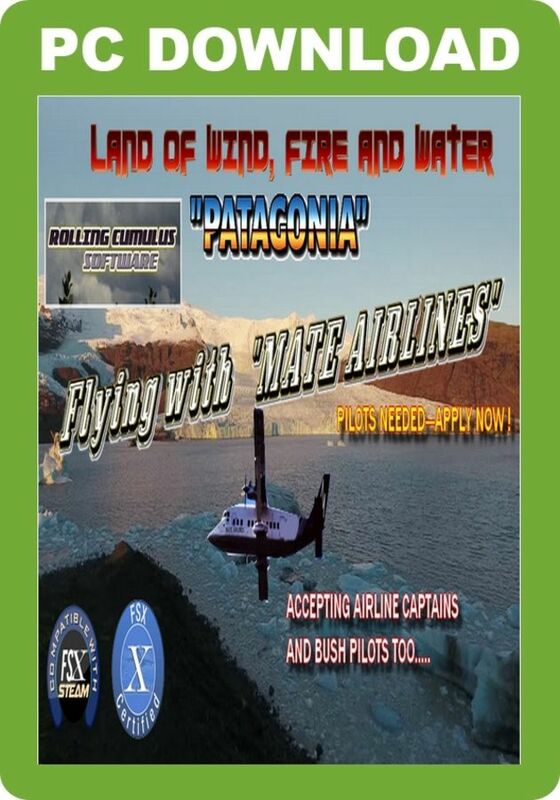 New in the Rolling Cumulus 'Imposing Flights' series - FLYING WITH 'MATE AIRLINES'- FLYING IN PATAGONIA - specially made for use with the VirtualCol Shorts 330-100. 'Mate Airlines' was found by Emergildo Bitty Ortezon in 1934. Since then the airline has been providing the many settlers in the sparsely populated Patagonia region of Chile and Argentina with the means to get from one place to another. Today the airline has two planes - a Shorts 330 and a DC-3 which has been flying since 1939. The schedules are busy and a new pilot is needed - YOU have been chosen because of your qualifications as well as the many hours you have logged in flights around the Andes. This Rolling Cumulus mission pack for FSX provides ten flights in the sparsely populated Patagonia region of Chile and Argentina and comes with new 'cinematised' airports and runways, all the essential information for the destination airports, new airport scenery and four weather themes. The missions have been developed for the VirtualCol Shorts 330-100 but can be flown in any aircraft.